I love the motto - TEAM - Together, Everyone Achieves More. It seems to fly against the "Lone Ranger" approach that a lot of Americans seem to embrace. When we TEAM up, problems are solved and opportunities abound! On Saturday, weather permitting of course, the plan is to try to fill a sizable "pit" with pea gravel, underneath the playground at the church. It will be one of the Neighbor2Neighbor service projects teams from the church will complete. Fast forward to this morning. A Google search (got to love Google) told us that newspaper could be used - but we didn't know how we could we get enough papers gathered between now (Wednesday) and Saturday to accomplish the task. A call to the staff at the Siloam Springs Herald Leader did the trick. 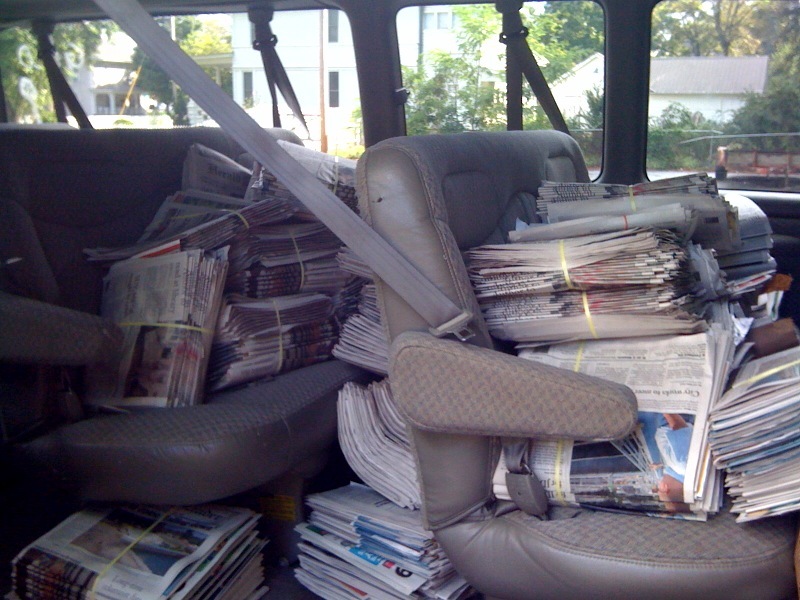 Not only did they have newspapers available (the recycle truck hadn't come yet today), but they said if we got there, before the truck, we could have what we needed. 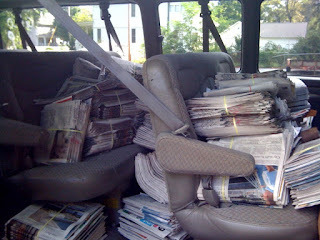 So, thanks to them, we now have a church van FILLED with newspaper, awaiting Saturday's work day. The picture above is just two seats filled with papers! The Herald Leader staff didn't have to let us have the newspapers. They could have just let the regular recycling guys come to pick up the bundles. But instead, they stepped away from the norm and provided (we hope) enough to serve as our ground cover. They were a vital link in the process, that includes several people and businesses, who have stepped forward to help First UMC - Siloam Springs, build a playground. Yes, the playground is on church property, but it is open for use by anyone visiting downtown Siloam Springs. So Siloam Springs Herald Leader, thanks for being part of our TEAM! We appreciate you. More pictures and comments later, but today's small action was a great example of TEAM-work, that I just had to share!